Hopefully they can prove whether or not these are real or not fairly soon. Then… maybe we can get some translations. No doubt that this could be a HUGE find! I wish we had more images of it – I wonder if there are any text or if it is just images, it is also sad that there are fakes out there. I remember scholars discussing the Gospel of Judas Iscariotes and arguing that if it was a fake, the perpetrators would have to know as much ancient Greek (was it Greek or Aramaic?) as they did. Wendell- Yes, I wish we had more images. However, I’m sure we will have them in time. FYI, the Gospel of Judas was actually written in Coptic. Hi, I’m one of those who has found their way to your site because of these codices. Interesting site too might I add. I look forward to reading about the information they get from examining these objects. 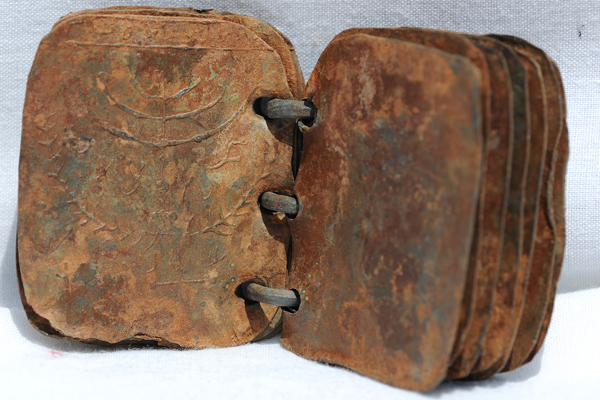 Are there other historical examples of metal books from the 1st century like these? Ed – the only similar example I can think of (and I’m definitely open to someone chiming in on this…) is the Copper Scroll (no – not a codex) found at Qumran dating from roughly the same time. On the second codex pic you show on this post – which seems like it may be the seven-sealed book the comment on the other post alludes to (though certainly not THE seven-sealed book in Revelation) – the image on the cover (front or back? would the left-to-right/right-to-left divergence have developed so early in codices?) seems to echo the staff of Aaron/pomegranate staff on the coins of the Judaean rebels. I’ve also noticed some mention and maybe one shot of a cross, which leads me to doubt the Christian application, if ancient. The cross was not an object of visual veneration for some centuries, as I understand. At least one mention suggests the cross is pictorial (i.e. a drawing of the actual cross with a tomb and Jerusalem pictured in the background), but I’m really not aware of pictorial traditions in late-antique Judaea, so that may bypass my previous reservation. Thanks for the posts, especially the previous one about the possible Qabalistic purpose of the alledgedly- ancient codices. Gives me the impression Mr Saida has not come up with this collection from one source only. I expect he has seen an intial example and have been trying for years to collect more of this kind. His truckdrivers where helpfull to transport the items. on the top of your page. 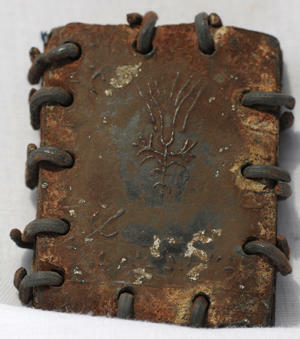 Previous Previous post: Newly Found Lead Codices – Christian or Kabbalistic?